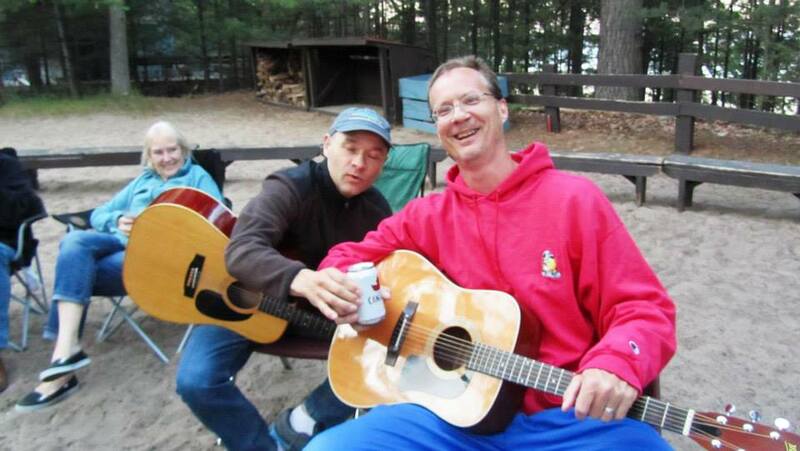 Cousin Klaas learned in a hurry not to steal my Hoser beer during the campfire jam. Fun fun fun! JUST GOT BACK from a glorious trip to Ontario for a Hart Family Rebellion. Sheryl survived. It was a great time. We stayed on an island on the Georgian Bay north of Barrie, a YMCA camp known as Kitchie. We took a ferry to the island from Honey Harbor. Camp Kitchie provided a place to sleep and meals. I sat in the early summer sun all day Saturday, and played guitar all night Friday and Saturday. I got blisters on me fingers. It's a beautiful thing. Much love and thanks to my aunt Willa, who organized the whole event, and to my cousin Natalie and her family for taking us from Grand Rapids to Hoserland. The border crossings were a breeze, maybe we were good luck. I haven't worn a watch in five days and I'm so much better for it. When you go to a place like this, time does not exist, unless you hear a dinner bell. You. Just. Hang. I was amazed Friday and Saturday nights at how time flew when we were jamming by the campfire. I have some very talented family guitar players and it was more fun than should be allowed. You know you are getting old when your hand hurts after you've played all night. My favorite part was getting the staff of young people to sing "Fat Bottom Girls" with us. YCMIU. Stay young forever, Camp Kitchie staff. I'm ready to do it again next year!